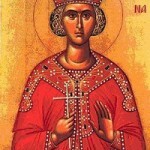 During the end of the 3rd century AD St. Panteleimon, the Great Doctor and Martyr, was born. 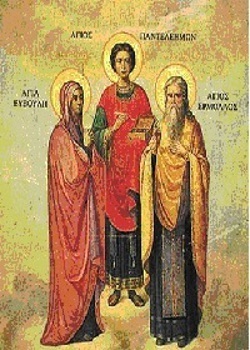 His father, Eustrogios, was not only very rich but was well known for his zeal in idol worship; whereas his mother St. Euboule was a faithful Orthodox Christian full of Holy Spirit, love and kindness. Her only interest was to guide her only begotten son in the true faith and virtuous life. 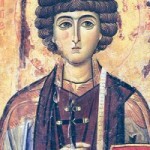 St. Panteleimon’s first name was Pantoleon. When he was very young his mother, St. Euboule, passed away and his father taught him to worship the false gods of their ancestors. 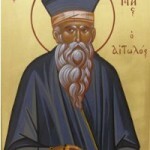 He studied under the guidance of the wise doctor Euphrosynos, and shortly differentiated from all his other classmates in wisdom and all virtues. Even the Roman Emperor Maximianus admired his kind character, that he ordered Euphrosynos to teach him all the secrets of medicine, so that Pantoleon become his own personal imperial doctor. At that period of time, in the Greek city of Nicomedia, there was an old man named Ermolaos, who was the Orthodox Priest of the city. He foresaw, that the young Pantoleon will become a vessel of Christ’s Grace and will glorify Him through his life. One day, as Pantoleon was passing by, he called the young doctor to his house and asked him about his family and religious beliefs. Pantoleon, as noble as he was, answered with politeness to all his questions. St. Ermolaos said to him, that the medicine which Asclepius, Hippocrates and Galenus taught is of no value, nor the gods of the Empire are true gods, but false and work of man. He taught Pantoleon about the Orthodox Christian Faith and that Christ is the only True God, Who created heaven and earth, and reminded him that his mother believed in Jesus Christ. He also emphasied that Christ is the True Physician of both soul and body and assured him, that if he believed in Christ, he shall cure all illnesses through God’s Healing Grace. Pantoleon heard all the wise words of Ermolaos. One day, as he was returning to his home, after school, he found on the side of the road a small boy, who died because he was bitten by a viper snake. Pantoleon prayed to Jesus Christ saying: ‘If You are the True God, as Ermolaos says, let this boy rise from the dead and let the viper die’. Immediately the boy came back to life and the snake blasted into pieces. This was the proof which he needed. He returned to Ermolaos and demanded to be baptized. From that day onwards, the young doctor preformed so many miracles in the name of Jesus Christ that his fame travelled throughout the Roman Empire. From all places, Asia Minor, Greece and Rome ill people came to see the imperial doctor and to be cured from their illnesses. He never demanded payment for his services, but rather asked, that they believe in the True God and become Orthodox Christians. Unfortunately, the other doctors seeing that they were losing out, reported to Maximianus that his personal doctor, Pantoleon, was a Christian. The Emperor, at first, did not want to believe this rumour. He sent soldiers to bring forth Pantoleon and asked him personally. When the young man stood before the Emperor, he confessed his faith in the One and Only True God. In order to prove the falsehood of the gods Pantoleon cured a blind man, but the Emperor did not believe. “Great is the God of the Christians, He is the One and True God, let the righteous be set free”. From all these martyrdoms Pantoleon was protected by God’s Grace, and thus His Name was glorified through His servant. ‘From now on your name shall be Panteleimon, for in your name I shall work signs and wonders; and if anyone calls with faith upon your name he shall be cured from any illness he has’. 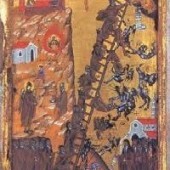 At the strike of the sword on St. Panteleimon’s neck, the sword bended as though it was made out of wax. Everyone was filled with fear, but St. Panteleimon demanded, that they should carry out the Emperor’s order, and thus he was beheaded. 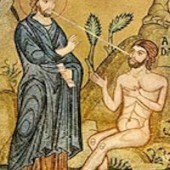 When his blood fell on the roots of the dry olive tree, immediately it gave new branches, leaves and olives. This olive tree existed till l945, but the Turks, after l640 years, cut it down. This is the life and the martyrdom of the Great Martyr of Christ Panteleimon, whom our Orthodox Church celebrates today. Everything he did and lived for was for Christ’s glory. He never gave in to worship false gods or teachings. He never placed worldly riches or pleasures above his love for Christ. We, as Orthodox Christians, must recall the lives of these heroes of our Orthodox Christian Faith, because are the living proof that man can be saved in Christ. We must imitate their faithfulness to our Lord and Saviour. 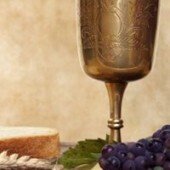 We must take their example of virtuous life and become living temples of our True God. We must give testimony to the world which lives in the darkness of faithlessness and ignorance of the true Faith in Christ. 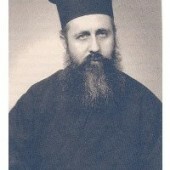 We must never forget, that our Orthodox Faith is the true and original which leads man to salvation. In this Faith millions of Martyrs found the strength to overcome trials, persecutions, martyrdom and finally death itself. Within our Orthodox Church we have the living proof, the existance of the Saints, Holy Martyrs and Ascetics, who gave their lives for Christ’ s name sake and were brought forth to Kings and rulers of the world. They testify, that Orthodoxy leads man to his sanctification and salvation. The Saints of our Church are the true friends of Christ, who proved their love to Him and because of this love, they sacrificed everything for His glory. Let us imitate them. 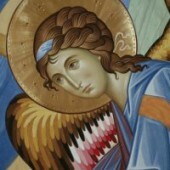 My beloved friends, today our Orthodox Church throughout the world commemorates St. Panteleimon’s feast day. Let it be for us, who live here in South Africa a reason to fill our hearts with zeal and love for Christ.